On Dec 23, 2010, the "Kardeniz" suffered rudder failure in the bight of Dordtse Kil in the outer Maas and ran aground on a sandbar. The KNRM-boat of Dordtse, the "KBW 1910", was alarmed at 4.15 p.m. and on scene half an hour later as well as the fire rescue and marine police. A tug of Van der Wees refloated the vessel, and the rescue units were stood down at 5.15 p.m. 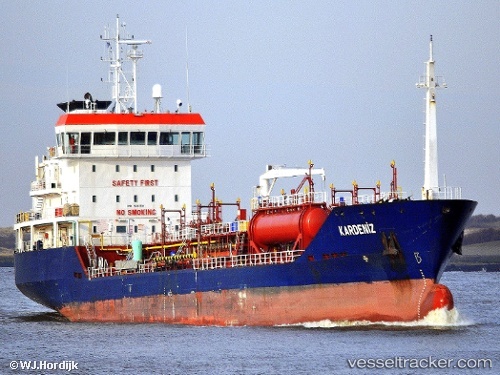 The "Kardeniz", which had just departed from Rotterdam, was anchored at RTM Anchorage N off Hoek van Holland at 8.15 p.m.
Around 0200 LT Nov 28 2010 in 52 26 N 003 54 W some 23 nm W off Ijmuiden collided two tankers, LPG Trout and chemical Kardeniz, both vessels proceeding roughly in one direction, Trout 194 deg speed 9.6 knots, Kardeniz 184 deg speed 13.6, Kardeniz struck Trout in engine room area, so it’s a case of collision in overrunning. Trout got a hole 1.4 meters dia, water ingress. Drifting Trout reported collision to Dutch Coast Guard, which directs to the scene safeboat and tug, or several. Kardeniz was permitted to resume voyage. No reports on spill or both vessels’ cargoes. As of 0440 UTC Trout proceeding to Rotterdam at a speed 3.8 knots, Kardeniz was ahed some 3 miles, but signal lost. The "Kardeniz" sailed to HDW Kiel on Nov 8 for repairs.